Downsizing refers to the permanent reduction of a company's workforce and is generally associated with corporate reorganization, or creating a "leaner, meaner" company. For example, the database developer Oracle Corporation reduced its number of employees by 5,000 after acquiring rival PeopleSoft. Downsizing is certainly not limited to the U.S.; Jamaica Air cut 15 percent of its workforce in an effort to trim expenses and anticipated revenue shortfalls. Downsizings such as these are also commonly called reorganizing, reengineering, restructuring, or rightsizing. Regardless of the label applied, however, downsizing essentially refers to layoffs that may or may not be accompanied by systematic restructuring programs, such as staff reductions, departmental consolidations, plant or office closings, or other forms of reducing payroll expenses. Corporate downsizing results from both poor economic conditions and company decisions to eliminate jobs in order to cut costs and maintain or achieve specific levels of profitability. Companies may lay off a percentage of their employees in response to these changes: a slowed economy, merging with or acquiring other companies, the cutting of product or service lines, competitors grabbing a higher proportion of market share, distributors forcing price concessions from suppliers, or a multitude of other events that have a negative impact on specific organizations or entire industries. In addition, downsizing may stem from restructuring efforts to maximize efficiency, to cut corporate bureaucracy and hierarchy and thereby reduce costs, to focus on core business functions and outsource non-core functions, and to use part-time and temporary workers to complete tasks previously performed by full-time workers in order to trim payroll costs. The following sections discuss trends in downsizing, the growth of downsizing, downsizing and restructuring, criticisms of downsizing, support for downsizing, and downsizing and management. As a major trend among U.S. businesses, downsizing began in the 1980s and continued through the 1990s largely unabated and even growing. During this time, many of the country's largest corporations participated in the trend, including General Motors, AT&T, Delta Airlines, Eastman Kodak, IBM, and Sears, Roebuck and Company. In the twenty-first century, downsizing continued after a sharp decline in the stock market early in the century and followed by continued pressure on corporate earnings in the aftermath of the September 11, 2002, terrorist attacks. Downsizing affects most sectors of the labor market, including retail, industrial, managerial, and office jobs, impacting workers in a wide range of income levels. Table 1 compares the number of temporarily downsized workers with the number of permanently downsized workers. While layoffs are a customary measure for companies to help compensate for the effects of recessions, downsizing also occurs during periods of economic prosperity, even when companies themselves are doing well. Consequently, downsizing is a controversial corporate practice that receives support and even praise from executives, shareholders, and some economists, and criticism from employees, unions, and community activists. Reports of executive salaries growing in the face of downsizing and stagnant wages for retained employees only fan the flames of this criticism. In contrast, announcements of downsizing are well received in the stock markets. It is not uncommon for a company's stock value to rise following a downsizing announcement. However, economists remain optimistic about downsizing and the effects of downsizing on the economy when the rate of overall job growth outpaces the rate of job elimination. A trend toward outsourcing jobs overseas to countries with lower labor costs is a form of downsizing that affects some U.S. employees. These jobs are not actually eliminated, but instead moved out of reach of the employees who lose their jobs to outsourcing. Some economists, however, suggest that the overall net effect of such outsourced jobs will actually be an increase in U.S. jobs as resulting corporate operating efficiencies allow for more employment of higher-tier (and thus higher-wage) positions. Regardless of whether downsizing is good or bad for the national economy, companies continue to downsize and the trend shows few signs of slowing down. For some sectors, this trend is projected to be particularly prevalent through 2012, as shown in Table 2. Adapted from: U.S. Department of Labor, Bureau of Labor Statistics. 2005. 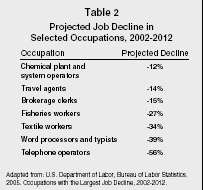 Occupations with the Largest Job Decline, 2002-2012. The corporate downsizing trend grew out of the economic conditions of the late 1970s, when direct international competition began to increase. The major industries affected by this stiffer competition included the automotive, electronics, machine tool, and steel industries. In contrast to their major competitors—Japanese manufacturers—U.S. companies had significantly higher costs. For example, U.S. automobile manufacturers had approximately a $1,000 cost disadvantage for their cars compared to similar classes of Japanese cars. Only a small percentage of this cost difference could be attributed to labor costs, however, but labor costs were among the first to be cut despite other costs associated with the general structure of the auto companies and their oversupply of middle managers and engineers. Auto workers were among the first to be laid off during the initial wave of downsizing. Other U.S. manufacturing industries faced similar competitive problems during this period, as did some U.S. technology industries. Companies in these industries, like those in the auto industry, suffered from higher per-unit costs and greater overhead than their Japanese counterparts due to lower labor productivity and a glut of white-collar workers in many U.S. companies. To remedy these problems, U.S. companies implemented a couple of key changes: they formed partnerships with Japanese companies to learn the methods behind their cost efficiencies and they strove to reduce costs and expedite decision-making by getting rid of unnecessary layers of bureaucracy and management. Nevertheless, some companies began simply to cut their workforce without determining whether or not it was necessary and without any kind of accompanying strategy. In essence, they downsized because they lacked new products that would have stimulated growth and because their existing product markets were decreasing. Downsizing generally accompanies some kind of restructuring and reorganizing, either as part of the downsizing plan or as a consequence of downsizing. Since companies frequently lose a significant amount of employees when downsizing, they usually must reallocate tasks and responsibilities. In essence, restructuring efforts attempt to increase the amount of work output relative to the amount of work input. Consequently, downsizing often accompanies corporate calls for concentration on "core capabilities" or "core businesses," which refers to the interest in focusing on the primary revenue-generating aspects of a business. The jobs and responsibilities that are not considered part of the primary revenue-generating functions are the ones that are frequently downsized. These jobs might then be outsourced or handled by outside consultants and workers on a contract basis. Eliminating non-core aspects of a business may also include the reduction of bureaucracy and the number of corporate layers. Since dense bureaucracy frequently causes delays in communication and decision-making, the reduction of bureaucracy may help bring about a more efficient and responsive corporate structure that can implement new ideas more quickly. Besides laying off workers, restructuring efforts may involve closing plants, selling non-core operations, acquiring or merging with related companies, and over-hauling the internal structure of a company. The seminal work on restructuring or reengineering, Reinventing the Corporation, by Michael Hammer and James Champy, characterizes the process as the "fundamental rethinking and radical redesign of business processes to achieve dramatic improvements in critical, contemporary measures of performance such as cost, quality, service, and speed." While discussion of reengineering is common and reengineering is often associated with downsizing, Hammer and Champy argue that reengineering efforts are not always as profound. Hence, these efforts frequently have mixed results. Downsizing and reengineering programs may result from the implementation of new, labor-saving technology. For example, the introduction of the personal computer into the office has facilitated instantaneous communication and has thus reduced the need for office support positions, such as secretaries. The loss of highly-skilled and reliable workers and the added expense of finding new workers. An increase in overtime wages. A decline in customer service because workers feel they lack job security after layoffs. Employee attitudes that may change for the worse, possibly leading to tardiness, absenteeism, and reduced productivity. An increase in the number of lawsuits and disability claims, which tends to occur after downsizing episodes. Restructuring programs sometimes take years to bear fruit because of ensuing employee confusion and the amount of time it takes for employees to adjust to their new roles and responsibilities. Some studies have indicated that the economic advantages of downsizing have failed to come about in many cases, and that downsizing may have had a negative impact on company competitiveness and profitability in some cases. Downsizing has repercussions that extend beyond the companies and their employees. For example, governments must sometimes enact programs to help displaced workers obtain training and receive job placement assistance. Labor groups have reacted to the frequency and magnitude of downsizing, and unions have taken tougher stances in negotiations because of it. Instead of laying employees off, critics recommend that companies eliminate jobs only as a last resort; not as a quick fix when profits fail to meet quarterly projections. Suggested alternatives to downsizing include early retirement packages and voluntary severance programs. Furthermore, some analysts suggest that companies can improve their efficiency, productivity, and competitiveness through quality initiatives such as Six Sigma, empowering employees through progressive human resource strategies that encourage employee loyalty and stability, and other such techniques. Advocates of downsizing counter critics' claims by arguing that, through downsizing, the United States has maintained its position as one of the world's leading economies. Economists point out that despite the downsizing that has become commonplace since the 1970s, overall U.S. standards of living, productivity, and corporate investment have grown at a healthy pace. They reason that without downsizing, companies would not remain profitable and hence would go bankrupt when there is fierce competition and slow growth. Therefore, some executives and economists see downsizing as a necessary albeit painful task, and one that ultimately saves the larger number of jobs that would be lost if a company went out business. Advocates of downsizing also argue that job creation from technological advances offsets job declines from downsizing. Hence, displaced workers are able find new jobs relatively easily, especially if those workers have skills that enhance the technological competence of prospective employers. In other words, despite the admitted discomfort and difficulties that downsizing has on displaced workers, some workers are able to locate new jobs and companies are able to achieve greater efficiency, competitiveness, and profitability. Moreover, even though downsizing may not solve all of a company's competitive problems or bolster a company's profits indefinitely, downsizing can help reduce costs, which can lead to greater short-term profitability. In addition, advocates of downsizing contend that staff-reduction efforts help move workers from mature, moribund, and obsolete industries to emerging and growing industries, where they are needed. Economists argue that this process strengthens the economy and helps it grow. This process also enables companies with growing competitive advantages to maintain their positions in the market in the face of greater domestic and global competition, and it is the difficult but necessary result of the transition toward a global economy. Downsizing poses the immediate managerial problem of dismissing a large number of employees in a dignified manner in order to help minimize the trauma associated with downsizing. Employees who are laid off tend to suffer from depression, anxiety, insomnia, high blood pressure, marital discord, and a host of other problems. Thus, when companies decide that downsizing is the best course of action, managers should do so in a way that does the least harm to employees and their families. This includes taking the time to allow dismissed employees to air their thoughts, instead of laying them off quickly and impersonally, and providing assistance in finding new jobs. Because of the possible negative effects that occur after downsizing, managers may have to implement measures to counteract employee apathy, improve customer service, and restore employee trust. Analysts of downsized companies argue that managers should take steps immediately after workforce reductions to provide the remaining workers with the support and guidance they need. This involves providing employees with clear indications of what is expected of them and how they can meet increased productivity goals. Managers should confer with employees regularly to discuss performance and strategies for meeting the goals. In addition, managers should encourage employee initiative and communication and provide employees with rewards for excellent work. By promoting employee initiative and even employee involvement in decision-making, managers can help restore employee trust and commitment and help increase employee motivation. The aftermath of downsizing also places greater demands on managers to make do with less. In other words, managers must strive to maintain or increase productivity and quality levels despite having a smaller workforce. Since downsizing often brings about a flatter corporate structure, the flow of information and communication no longer requires the effort needed prior to restructuring. Therefore, reports used for communication between layers of the old corporate hierarchy, for example, can be eliminated. If redundant but nonessential work cannot be completely eliminated, it perhaps can be reduced. By studying particular tasks and determining their essential components, managers can get rid of unnecessary tasks and eliminate unnecessary jobs altogether. Downsizing appears to be an ongoing practice for the foreseeable future. Top managers with responsibility for making downsizing decisions are in a difficult predicament. Failure to downsize may result in inefficiencies, while downsizing clearly has a number of potentially negative effects on individuals and communities. Finding the balance between these outcomes is the primary challenge facing these managers. Hammer, Michael, and James Champy. Reengineering the Corporation: A Manifesto for Business Revolution. Harper Business Publications, 2004. Mandel, Michael J. "Jobs: The Lull Will Linger." Business Week, 25 October 2004, 38–42. Marks, M.L., and K.P. DeMeuse. "Resizing the Organization: Maximizing the Gain While Minimizing the Pain of Layoffs, Divestitures, and Closings." Organizational Dynamics 34, no. 1 (2004): 19–35. Menn, Joseph. "Series of Layoffs Begins at PeopleSoft." Los Angeles Times, 15 January 2005, D1. Weber, Joseph. "More Jobs—and More Layoffs." Business Week Online, 16 June 2004. Available at http://www.businessweek.com . Very well written and researched. I enjoyed learning.